Racing back in the day! The 15 Meter Class was a product of the first International Rule of 1906. In the eight seasons of racing before the outbreak of war in Europe in 1914, the 15 Meter Class grew to into an impressive fleet, numerically, aesthetically and technically. Was expected to be the launching year of the 15 Meters but, in fact, it was mainly the swan song of the 52’s of the demised Linear Rule. Beside these were racers where everything was sacrificed to speed the two new 15 Meters. Shimna and Ma’oona raced together 35 times in the season; Ma’oona beat Shimna over the finish line in 20 of those meetings; Shimna beat Ma’oona on 15 occasions. The new Fife 15 Mariska had 519 sq.ft (48 sq.m) more sail area than Shimna, was shorter and narrower, with a fuller midship section and more freeboard. In some ways, Mariska appears closer to the Ma’oona style of hull, but in practice it seems more likely that Fife was becoming more familiar with the vagaries of the rule than any direct knowledge of Mylne’s work. In any event, Mariska was rated shorter than Shimna despite being very similar in reality (Mariska’s design waterline length was 49.0ft exactly, and her rated length was 52.91ft; Shimna’s DWL was 49.10ft but her rated length was 53.43ft), and as a result Mariska could have the extra sail area. She was also a heavier boat than Shimna at 33.88 tons. The 1909 season saw the real start of the growth in numbers with seven new yachts. The key decision was that of royalty to patronise the class; the King of Spain HRH Alfonso XIII, who already had a Fife 6 Metre, commissioned a 15 Meter design from Fife to be built in Spain and to be called “Hispania”. Tuiga was slipped into the cold Scottish waters at the boat builder William Fife’s yard. She had been commissioned by the Duc de Medinacelli, a close friend of the King of Spain, Alphonse XIII. William Fife designed Tuiga as a twin to the Fife-built Hispania, so that the two 15-meter JI vessels were equally matched for racing purposes. From a distance, the two sisters were indeed difficult to distinguish. Construction-time was rapid: a mere 6 months. It was whispered that the Duc de Medinacelli preferred to rein in Tuiga for fear of creating the embarrassing situation of having beaten his friend and sovereign King Alphonse XIII. S. M. King Alfonso XIII ordered the construction of the ship in 1908 in Karpad Shipyards from Pasajes (Spain) as designed by William Fife. Hispania had a length and beam of 23.20 and 4.12 meters respectively “; had a displacement of 40 tons and height Bat on deck 28 meters, the canopy developed a total area of ​​420 sq.m. The planking is. mahogany, 42 mm thick, the cover, pine from Canada, and the frames are made of steel and American elm. The Field’s summary of the year gave the class 60 starts; of which 22 (36%) were light, 13 (22%) “moderate”, 18 (30%) “fresh” and 7 (12%) “strong”; in summary, only slightly windier than 1909, and a fairly typical summer for racing. Conditions were more benign than in any previous season the 15s had seen; 34 out of 56 (61%) were “light”, ten “moderate” (18%), nine “fresh” (16%) and just three “strong” (5%). 1912 would pass into the 15 Meter class history as “Istria’s year”; the radical new design by Nicholson for Charles Allom dominated the season. Her innovative hull and rig were much remarked upon; and her race record by the year end was remarkably good.Istria started in 36 races and won 23 of them. The season was another long one, with 60 races planned; but strong winds caused many cancellations and in the end there were only about 43 starts. Of those, 12 (27%) were “light”, 9 (19%) “moderate”, 11 (25%) “fresh” and 11 (23%) “strong” or even “gale”. The Lady Anne was designed and built by William Fife for George Coats, the head of a wealthy Clydeside yachting family. One of his motives was to win back the premier prize for the 15 Metre class yachts, won in 1911 by the German owned Paula II. Sadly for Coats, C. E. Nicholson was simultaneously designing the radical Istria, which carried all before her during the 1912 season. However, after some fine tuning and modification, The Lady Anne came into her own, particularly in lighter winds, and eventually finished the season a close second. Further alterations to the hull and rig in the 1912 /13 winter kept her competitive, but Istria and her ilk were leading the way. Altered yet again in 1913 to the so-called Marconi rig, the war intervened in the 1914 season before much use could be made of her. The season had 54 races scheduled, and in addition to that 15s raced at Kiel (but again the fleet was split with some opting to do the Clyde fortnight instead). 31 (57%) were light, 13 (24%)”moderate”, and only four (7%) “fresh” and six (11%) “strong”, so it was a very light year on average. The outbreak of war in early August cut the season short with the class tantalisingly poised. After 1914, many 15s continued to race in Scandinavia and beyond; some survived as racing and cruising yachts for many decades. In that sense, the rule was successful in the stated aim of creating strong, habitable cruising yachts; but it is notable that not all the yachts were as durable. 2012 THE RESURRECTION OF THE 15 METER CLASS. 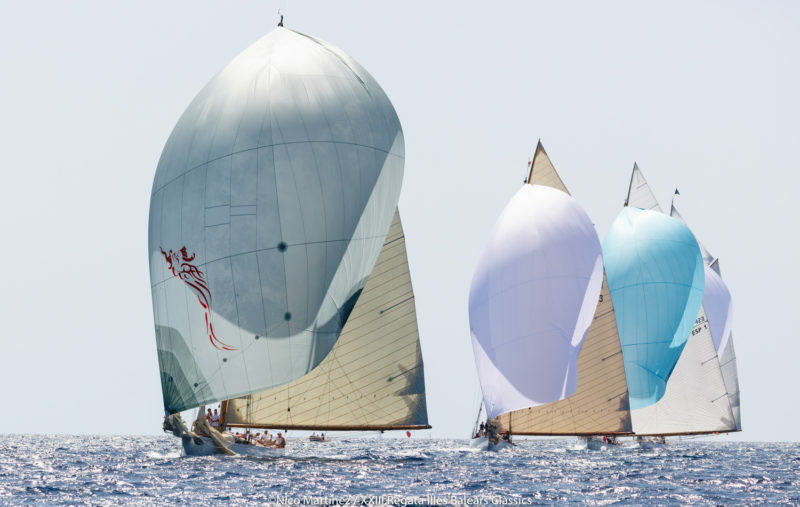 The first season of the recovered 15 Meters Class began in Puerto Sherry (Spain), but the fact is that the first reunion of the four surviving yachts was at the Monaco Classic week at the end of 2011. 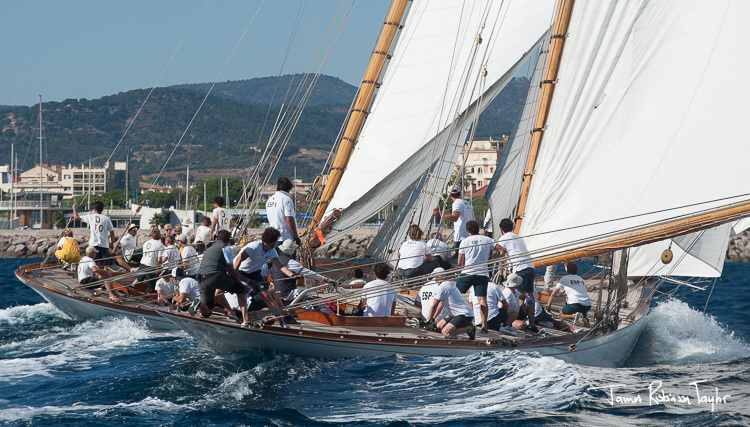 After the results of the three major events of the first season of 15 Meter Class Association, composed of Puerto Sherry (Spain), Vele d’Epoca di Imperia (Italy) and the Voiles de Saint – Tropez (France), The Lady Anne, which celebrated its centenary this year, led by Paul Goss and his British crew won the 15 Meter Class Annual Trophy. Information courtesy of the 15-Metre Class Association.